One of the great advantages to working with EverGreene Architectural Arts is our single-source capability to assist you through an entire project, from beginning to end. 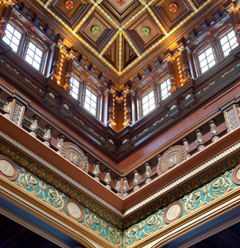 From restoration to conservation, from plasterwork to decorative painting, from new artwork to historic fine art, from surface preparation and quality coatings to custom decorative finishing treatments, EverGreene can help you execute all of your well-laid plans and designs. Encyclopedic knowledge of the materials and techniques of the architectural arts and three decades of hands-on experience have enabled us to develop innovative methodologies for creating and preserving art in architectural settings. Clients also benefit from our unified artistic vision and our consistently high standards of artistry and craftsmanship, all informed by a cross-disciplinary approach integrating conservation science, restoration craftsmanship, advanced technology, art history, architecture, engineering and construction.